Life Diagnostics Inc., manufactures ELISA kits for cardiac troponin-I, myoglobin, fatty acid binding protein, and myosin light chain-1. Kits are available for species including mouse, rat, rabbit, dog, pig, and monkey. Our kits have been used extensively since 2003 and are widely referenced in the scientific literature. In November 2011 we launched a series of ultra-sensitive cardiac troponin-I kits that can be used for measurement of this important biomarker in both serum and plasma. The Ultra-Sensitive kits are approximately four-fold more sensitive than our High-Sensitivity kits. IMPORTANT: Serum or plasma that is to be used for measurement of cardiac biomarkers must not be collected by cardiac puncture or any other method that causes damage to the heart. Cardiac puncture causes release of very high levels of cardiac biomarkers into the blood thereby invalidating study results. Literature references detailing the use of our cardiac biomarker ELISA kits are listed at the bottom of this page. For technical advice please email us at techsupport@lifediagnostics.com. All kits are manufactured by Life Diagnostics, Inc.
1The “-US” (ultra sensitive) versions of our cardiac troponin-I kits can be used with serum or plasma samples. They require a total incubation time of three hours and twenty minutes whereas the high sensitivity (HS and HSP) versions of the kits require a total incubation time of one hour and twenty minutes. *Please note that use of urine and plasma may require dilution of samples with the kit dilution buffer in order to avoid matrix effects. 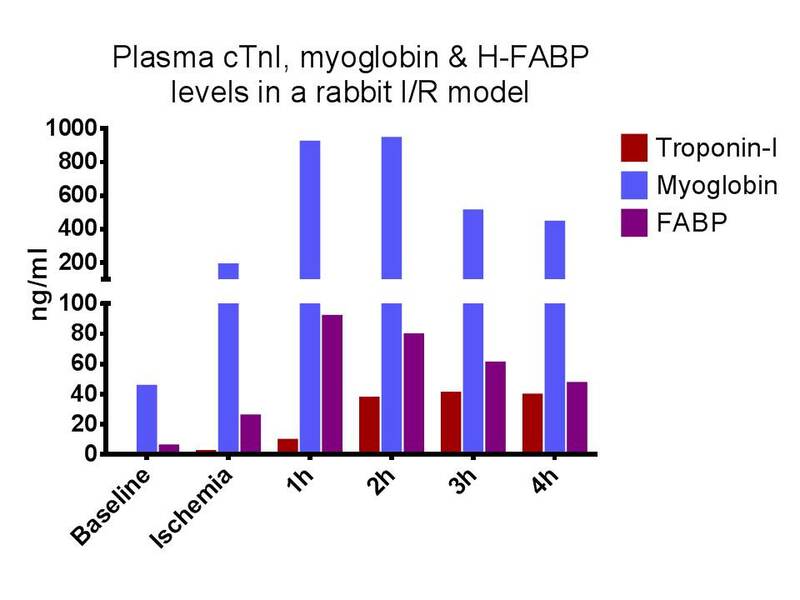 The figure below illustrates the utility of our animal troponin-I, myoglobin, and FABP kits. 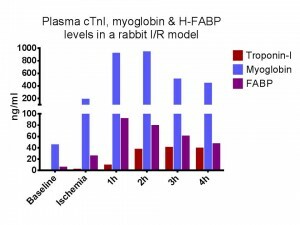 It shows the levels of the respective markers in plasma obtained from a rabbit cardiac ischemia/reperfusion model. Plasma samples were collected before/during ischemia and at various times after reperfusion. Consistent with clinical findings in humans, it can be seen that (i) the levels of myoglobin and FABP increase prior to those of troponin-I and (ii) troponin-I levels remain elevated longer than do those of myoglobin and FABP.